Do you love gorillas? Me too! So do the people of Virunga National Park, our Feel Good Friday organization for today. If you get a chance to watch the Netflix documentary, Virunga, I recommend it. This is where I learned all about Virunga National Park and the rangers that are risking their lives to protect it. If you haven't heard of this park, the website gives you a quick breakdown. "Virunga National Park is a UNESCO World Heritage Site in the eastern Democratic Republic of Congo, on the border of Uganda and Rwanda. Virunga is Africa's oldest national park and is also the continent's most biologically diverse protected area." In addition to all that, "Virunga is home to about a quarter of the world's critically endangered mountain gorillas." It was founded in 1925 by King Albert I of Belgium, primarily to protect the mountain gorillas living in the area. The last few decades have been dramatic. In 1994, over one million refugees from the Rwandand genocide came into DROC, placing pressure on the park forests and wildlife. In 2007, people from the charcoal mafia (for real) killed nine mountain gorillas to eliminate any motivation to protect the park. Despite all this, partnerships between the park and foundations were formed in 2008, and the park is now open for tourism. In addition to hosting tourists who come to visit the mountain gorillas, Tongo chimpanzees and Nyiragongo volcano, the park runs several programs. Their main focus is protecting the 95 habituated gorillas and surrounding wildlife. Senkwekwe Center, located in the park, is the only facility in the world for critically endangered orphan mountain gorillas. Rangers also protect the elephant population, which has been reduced from 3,000 to 400, and are training bloodhounds to apprehend and arrest poachers in the park. The people who do this work do so at great risk. In the last 20 years, over 150 park rangers have been killed protecting Virunga National Park. The Fallen Rangers Fund was created to support widows and children of rangers killed in the line of duty. 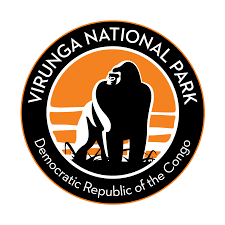 To support the people and wildlife in Virunga, you can make a donation and stay in the social media loop by liking their Facebook page and following them on Twitter @gorillacd. Best of all, if you're planning a trip to Africa, you can support the park by visiting! I think that's the win-winiest option of them all.